Camber Security Group comprises of Camber Security Ltd and Camber Alarms Ltd. Both companies are family owned and run with a clear ethos of ‘customer service first’. Since 2008 they have grown to become one of the leading security companies in London, serving a diverse client base throughout London, Surrey and the whole of the UK. Camber Security Ltd was established in September 2008 and manages, operates and provides clients with our, ‘manned’ security solutions, such as static security guards, mobile security patrolling, key holding and alarm response services across a wide variety of industry sectors, such as Retail, Corporate and the Film & Television industry. All security operations are generally controlled from our head offices based in Surrey. Camber Alarms Ltd was established in March 2014 to specifically manage and operate our ‘Technical’ security services, such as alarms, CCTV, access control, etc. We established Camber Alarms Ltd as we felt we needed to have a dedicated company and organisational structure to deal with the large increase in the technical services we currently provide to our clients. All technical security services are generally controlled from our regional office in Essex. 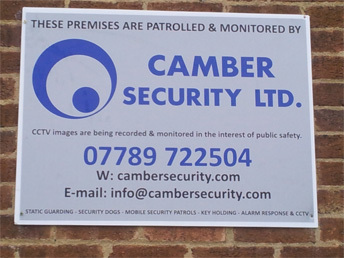 Both Camber Security and Camber Alarms operate across the whole of the UK. We are registered with the Information Commissioner’s Office for the control of Data under the 1998 Data Protection Act. We are now members of the ‘Approved Contractor Scheme’ (ACS) of the Security Industry Authority (SIA), and hold ISO: 9001 Quality Management and ISO: 14001 Environmental Management certifications.